Talent intelligence is a key differentiator in today's hyper-competitive world where the human capital of an organization is its principle engine of production. This report, created in conjunction with partner Human Capital Institute (HCI), is based on an extensive survey of more than 600 global organizations. 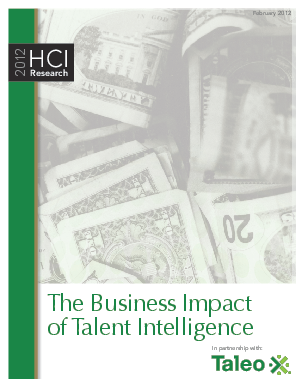 It examines the far-reaching economic impact of talent intelligence, identifying connections between its use and overall corporate performance. The report reveals the companies that best satisfy the demands of their leaders are those that place heightened importance on and provide greater visibility into workforce data, delivered in a way that empowers managers to make more informed, rapid business decisions.